For the cookout’s main course for the kids and the vegetarian option, we wanted to do a simple pasta dish. One that would be made from scratch, but only needed a few minutes to prepare and serve as – from experience – we always tend to get in a time squeeze come main courses. This recipe is from Daniel Gritzer over at Seriouseats.com. I wasn’t able to take a picture before it was devoured, so I had to revert to the original photograph from the recipe made by Vicky Wasik. It was a weird experience to make a pancake like batter without any milk and eggs and use water instead. I didn’t have a cast iron skillet at the time, so used a special pancake pan from Tefal. As the pan was not yet hot enough when I started, it could not cope with this type of batter, so the first one was a bit dodgy. Afterwards, it went really well and the batter yielded about 10 pasta pancakes. Take your time to get them brown properly, undercooked ones are not very nice. After cooling and them individually (instead of stacked), I used a pizza cutter to create small slices. 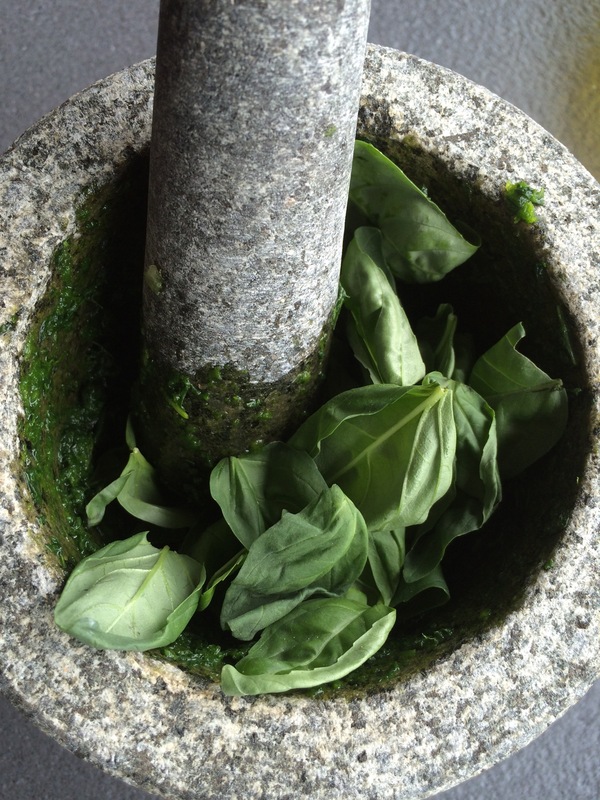 For the pesto we used Seriouseats’ already tried and tested recipe and Koen provided the necessary elbow grease grinding everything in the pestle and mortar 💪🏻. As expected the pesto tasted great. The recipe is accurate, but from a portion perspective, it’s not enough for 4 adults, or perhaps only as a starter. We used about slightly more than half of the pesto in order not to overwhelm the pasta. I followed the recipe and added the water to the dry ingredients…. and had to strain it through a sieve to get the lumps out before aerating the batter. In the restaurants that I worked for we actually slowly added the dry to the wet ingredients with a sieve while whisking continuously in order to avoid lumpy batters. I tend to think this method works better especially if there are significant amounts of liquid to incorporate. Verdict: 8/10; (Apparently) nice and less messy than making other types of fresh pasta. Also a good one to get the kids involved in the kitchen. Will be made again.